Long time ago I saw a dream about jars full of strawberry jam. In my dream three children found jars from an old-fashioned cellar located in the green countryside. When I woke up from my dream Ithought, for some reason, that the scene of the dream is going to be a landscape for my home. I remembered my old dream again when I borrowed a book from a library. The book is Hermann Hesse's 'Wandering' (1920). In one of his short stories Hesse writes about a red house which evokes his desire to have a house in a garden, silence around and a village nearby. But he realizes how he spends his life between yearning to travelling and the state of homesickness. However, as Hesse was a man searching for a inner deeper life he quotes the German Romantic writer Novalis ” Thus, where are we going? Always home. ” and hoped to find his home inside the man without a demand for a red house. The most interesting sentences in Hesse's book are the ones where he praises the importance ofpolarities. If the polarities would disappear you would reach nirvana. Hesse writes how for him polarities still burn brightly, those dear stars of longing. I spent last weekend in Tampere in Southern Finland. 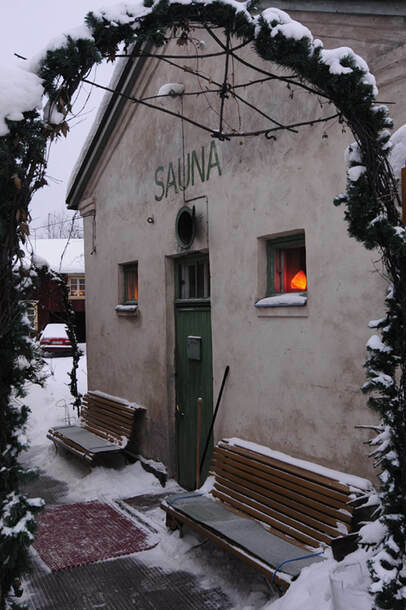 There I visited a public sauna, the oldest one still left in Finland. I sat there in the soft wet hotness and listened to stories of my fellow bathers. This place is somewhere between private and public: I can sit silently in my thoughts andsometimes I come part of conversations about hair dyeing or what is the right way to be politically active. The public sauna in Tampere is not the landscape of my dream but it is a glimpse of welcoming comfortable safety. To The Blog "Packing and Mourning"